Casey Hayward Jr. (born September 9, 1989) is an American football cornerback for the San Diego Chargers of the National Football League (NFL). He played college football at Vanderbilt. Hayward was drafted by the Green Bay Packers in the second round of the 2012 NFL Draft. Hayward grew up in Perry, Georgia, with both of his parents (Casey and Tish Hayward) and began playing football when he was five years old. He attended Perry High School, where he was a three-sport star in football, basketball and track. In football, he was a three-year starter at quarterback and also played several games at cornerback. As a senior, he led his team to the state quarterfinals by passing for 1,300 yards and 18 touchdowns as well as rushing for 1,284 yards and another 18 touchdowns. He also had four interceptions, three of which he returned for touchdowns. His performance had him named the Region 4-AAA Player of the Year. He was also named an All-State defensive back and an All-middle Georgia player. Hayward was also a member of the team's leadership council and a starting guard in basketball. Also an outstanding track & field athlete, Hayward excelled in sprints and jumps. At the 2008 Patriot Invitational, he earned a second-place finish in the triple jump event, posting a career-best leap of 13.93 meters (45 ft, 6 in), while also placing twelfth in the 100-meter dash, with a time of 11.48 seconds. He recorded a personal-best leap of 6.83 meters (22 ft, 3 in) in the long jump at the Harmon Invitational, where he took gold. He also ran a PR of 22.75 seconds in the 200-meter dash. In addition, he ran the 40-yard dash in 4.43 seconds, bench-pressed 255 pounds, squatted 400 pounds and had a 33-inch vertical. Coming out of high school, Hayward was measured to be 6 ft 1 in and 185 pounds. He received very few scholarship offers from division schools, which he attributed to being "strictly a quarterback". He was scouted by Georgia Tech, Louisville, Middle Tennessee State, North Carolina, Southern Miss, and Troy. Hayward ultimately chose to attend Vanderbilt University because of the school's academic ranking and the fact that the school is a member of the Southeastern Conference. He immediately played during his freshman year and made his permanent move to defensive back as a Nickelback and also on special teams. In 2009, he was promoted to the starting role and played in every game, although he did miss most of two games due to injury. He was named the defensive player of the week against LSU after contributing 13 tackles (eight solo) with 4 for a loss. He was also named the team's most valuable defensive back. Hayward continued to make an impact going in to 2010 and started every game of the season. He had six interceptions, 70 tackles (59 solo), and 17 passes defended. He ranked first in the SEC and 3rd in the NCAA for passes defended. His performance earned him a spot on the second team All-SEC as a defensive back by the coaches and media. During his final season as a Vanderbilt Commodore, Hayward tied the career record for interceptions at 15 (also held by Leonard Coleman). He also made 62 tackles, and had seven interceptions, the third highest single season total by a Vanderbilt player. He was named a mid-season All-American by Sports Illustrated. At the end of the season, Hayward was named a second-team All-American by the Walter Camp Foundation, becoming the first Vanderbilt All-American in four years. Hayward with the Packers in 2015. Following his last season at Vanderbilt, Hayward participated in 2012 Senior Bowl and received an invite to the 2012 NFL Combine. Scouts praised his intelligence and instincts as well as his ability to recognize routes. They also stated that he was a good tackler with good footwork and durability. He was considered to have average speed, and is not as quick at stopping his back pedal. He was projected to be a second round pick. Hayward was selected in the second round (62nd overall) by the Green Bay Packers. During the month of October 2012, he won the NFL defensive Rookie of the Month, having intercepted 4 passes in 3 games. He finished 3rd for NFL Defensive Rookie of the Year and was named to the NFL All-Joes team. According to Pro Football Focus, opposing quarterbacks had a passer rating of 31.1 against him, the lowest against any corner in the league, having allowed 0 TDs, but intercepting the ball 6 times. His second season was lost due to a hamstring injury after allowing 1 reception in the preseason and intercepting the ball once. In 2014, Hayward was the Packers' dime cornerback, behind Tramon Williams, Sam Shields and Davon House. Pro Football Focus ranked him as the 9th best cornerback, having allowed 2 TDs, but intercepting the ball 3 times, despite playing in slightly over half the snaps as in '12. On March 13, 2016, Hayward signed a three-year, $15.3 million, deal with the San Diego Chargers. 1 2 3 4 Kyed, Doug. "2012 NFL Draft: Casey Hayward (CB, Vanderbilt) Interview". Nepatriotsdraft.com. Retrieved May 9, 2012. 1 2 3 4 5 6 7 8 9 10 11 "Casey Hayward". Vanderbilt. Retrieved May 9, 2012. 1 2 3 "Casey Hayward". Yahoo. 2008. Retrieved May 9, 2012. ↑ "Vanderbilt vs LSU (Sep 12, 2009)". 2009. Retrieved May 10, 2012. ↑ "Casey Hayward". Rivals. Retrieved May 10, 2012. ↑ "Coaches All-SEC Team Announced". Archived from the original on January 21, 2011. Retrieved May 10, 2012. ↑ "122nd Edition of the Walter Camp All-America Team Announced". Walter Camp Foundation. Retrieved May 10, 2012. 1 2 3 4 "Casey Hayward Scouting Report". NFL Draft Geek. Archived from the original on May 2, 2012. Retrieved May 10, 2012. 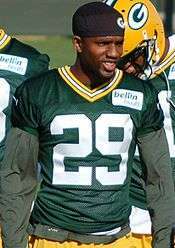 ↑ "Casey Hayward named NFL Defensive Rookie of Month". Packers.com. November 1, 2012. Retrieved 2012-11-03. ↑ Wesseling, Chris (March 13, 2016). "Casey Hayward signing with San Diego Chargers". NFL.com. Retrieved March 13, 2016.